154 Hidden Court: My best of 2013. 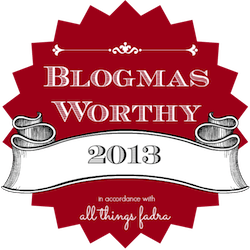 I've been blogging for almost seven years, and I've never done a wrap-up or "best of" year end post before. I'm not sure why not. Maybe it's because this time of the year is always so busy and I didn't want to take time to re-read everything I've ever written. Maybe it's because my personality usually dictates that I'm always moving on to the next thing instead of looking back. Whatever the reason, it's never really occurred to me before. But I've been feeling sort of BLAH about blogging lately. I feel like my writing is mediocre. I have IDEAS, they're just not coming to fruition like I want them to. So when I decided to look back over the past year and highlight a few favorite posts, I was pleasantly surprised to find some good work - really good writing - that I could highlight. These are not my most popular posts. They are not the ones that received the most comments or shares. But to me, they are the best written, the funniest, the most heartfelt. I hope you will take a minute or two to click through to something you might have missed. Seven. Zachary turned seven. I think my best writing comes when I'm talking about things I love unconditionally, like this kid right here. Practical advice for beginning runners - I've been running for three and a half years, and this is all the stuff I really wish I would have known before I started. Advice for raising boys - If only I would have taken this advice seriously when I first heard it, I would be in such a better place now. Polite boys - A total stranger really made my day. I highly recommend you do it for someone else, too. All that glitters - I've felt like my writing has been really flat this year, but then I ran across this post and I remembered that I really can be funny sometimes, too. Oh, and no baby vampires were harmed in the writing of this post. Thoughts on raising readers - I'm raising my boys to be readers. It's important to me. Here's how I'm doing it. Defining me - Like most women I know, I insist on labeling myself. Here are just a few of the things that I am. A ribbon for showing up - My thoughts on rewarding mediocre behavior. Spoiler: I'm against it. Happy Mother's Day - to me! Becoming a mama changed me profoundly... for the better. On becoming a stay at home Mama - year three. I celebrated my third anniversary of staying home with my kids with this post about how different I am now. It's a good, good thing. Apple, meet tree. Zachary and I are the same person, except for all the ways we are not. On bad coffee, fresh perspectives and an attitude adjustment. Cooper never fails to amaze me with his outlook on life. He teaches me something every day. Introverted parents, extroverted kids - My kid is an extrovert. I am decidedly not. This is how I cope. He's becoming more - I feel sometimes like Zachary is starting to outgrow me just a little. In the eye - On this particular day, Cooper made me feel like the most beautiful girl in the world. Oh nuts. - I don't think those words meant what he thought they meant. Five secrets for successful marriage - I should have it down by now. After all, I've married the same man twice. Note to a younger me - I sum up what I would tell my younger self in only two words. Well, sort of. Sounds of silence - Morning time is MY time. Until it isn't any more. Eight books - the eight books that changed me. So. There you go. These are the posts that stand out in my mind and my heart as my best writing of the year. Some are meaningful, some are funny, some are informational, but they all add up to a pretty good look back on 2013 for me. What's the best thing you wrote (or if you're not a writer, what's the best thing you read) in 2013?